Chiang Mai is one of the best places to experience a kiss of the exotic. The city is cooler than Bangkok because of its elevation and also much cheaper. It is also a haven for digital nomads. One of the best things about Chiang Mai and Thailand as a whole is the markets. This city is one of Thailand's most popular shopping destinations and has been throughout time. Chiang Mai has its fair share of shopping malls and stores, but the real attraction here is the proliferation of markets. If you're in the market for that memorable souvenir or just a great plate of food, head over to one of these incredible markets in the city. You'll soon find yourself lost in one of the most amazing shopping experiences of your life. There is nothing so wonderfully breathtaking as a Thai night market. 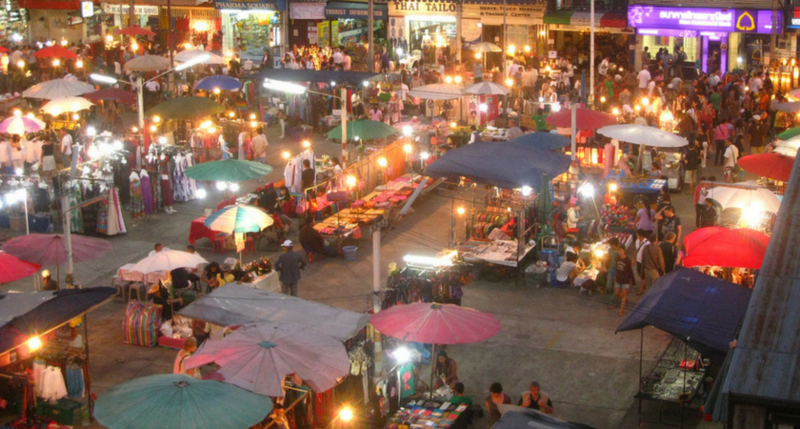 This is one of Thailand's oldest night markets and sprawls over several blocks. The market provides the usual knockoffs of designer labels and random funny t-shirts. Over time, it has grown immensely and now includes a wide variety of shops, from coffee houses to massage parlors and everything in between. Even better, this market is open every night of the week and is a great place for first-time visitors to get their feet wet. This famous market draws locals and tourists alike and is one of the most popular destinations in the city. Get to this market early in the afternoon to enjoy shopping while you have some elbow room, because this most famous of Chiang Mai's markets gets crazy-busy later on at night. Ratchadamnoen Road and its surrounds become a popular market on Sundays that is standing-room only, filled with a combination of local handicrafts and the usual tourist fare of the night markets. This is also a great place to try some truly local street food; the northern Thai influence is evident in the flavours and the exquisite taste is to die for. There are also plenty of street dancers and performers to keep you entertained while you walk through the market looking for that perfect souvenir to take home. The Chinatown district of Chiang Mai is worth seeing for itself alone, but this is also the location of the Warorot Fresh Market. This is a famous market in the city due to its popularity with the locals for fresh food and produce. This is also one of the ultimate destination for travellers wishing to sample northern fare, as the street food available at the market is some of the freshest in town. This is also the place to pick up fresh produce or foods to bring home for your friends and family. The extensive amount of dishes on offer make this market a haven for hungry and curious visitors. If you're looking for a more low-key affair with guaranteed unique local handicrafts, then this is the market for you. While there is also delicious street food on offer, Wua Lai is mostly for those who are looking to get away from the hustle and bustle while immersing themselves in the local culture. For a souvenir that is more personal than some of the cookie-cutter tourist tat, this is the place to be. There are interesting aluminium sculptures available here as well as various different types of silverwork. If you are looking for the largest variety of goods available at a market, then you'll be well served here. This market has a unique location beside the old city moat. Foodies love to visit Thailand because of the vast array of dishes available. Chiang Mai's cooler temperatures mean that fruits unavailable elsewhere in the country are plentiful here, such as passion fruit. This market is a foodie mecca and brings people from all over the city to enjoy the incredible cheap prices and to experience the real thing when it comes to Thai cuisine. This is a local favourite, and if you'd like to experience everyday life in the city this is the market for you. If you are not only shopping but buying in bulk, make a beeline toward the wholesale market. The tables groan under the weight of fresh produce, meat and fish. It's the perfect destination for savvy shoppers who want to watch their pennies while getting the most for their money. It's also a great place for raw foodies as it offers every kind of fruit available under the sun and provides some of the most healthy and delicious produce Thailand has to offer. Even though this market is located in the heart of the tourist district, it's an authentic experience in among all the usual attractions. It's one of the most conveniently located markets in the city. This market is almost entirely dedicated to food, and is a great place to stop by and enjoy a hot, delicious dish. This is a smaller fresh market for those who prefer a more intimate experience away from the madding crowds. Also known as the Chatuchak Weekend Market and unlike the other markets, JJ Market is located inside various buildings and is a far more modern experience. This market primarily sells antiques and handicrafts for those looking for that special Thai souvenir to take home. This enormous market covers 35 acres and offers just about everything you could possibly want to buy. It is a quiet and peaceful market for those who dislike crowds, and the local area has enough restaurants and shops to keep you busy over a pleasant afternoon. Food is a usual offering at the markets in Chiang Mai and Anusarn is no different. This is the largest night market in town. What sets it apart from the others aside from its size is that it also offers shows. This is night market is an offshoot of the original. Anusarn Market offers free cabaret shows and live performances where you can listen to music while you enjoy your food. It also offers all kinds of products, from paintings to sculptures to knickknacks, so you're sure to find something to your liking at this market. This popular market is the place to go if you're looking to pick up a second-hand bargain. Locals bring their used clothes and trinkets to sell, so it's a great way to experience everyday life in Chiang Mai and also score some incredible deals. You'll be thrilled to find some treasures here from the second-hand items that are on display. One thing is for sure: you won't be getting the same old souvenirs from this place! If you're on the lookout for something truly unique and one-of-a-kind, this is the market for you. If you're in the market for fresh flowers, this place is for you! The stall owners love to share their fresh flowers with visitors because they are extremely proud of their wares. This market is located along the banks of the Mae Ping River and is overflowing with tropical flowers as well as fresh produce. If you don't mind crowds and chaos, the market fills up at night with colour and sound as well as some of the best deals you will find anywhere in town. Another destination for flower-hunters, this market caters to those with a green thumb. This is the place to pick up plants and plant pots as well as a staggering variety of flowers. It's located just beyond the Tesco so it's an easy thing to pop over after you shop for your groceries. It's also a great place to see some amazing fish. This market is filled with all the kinds of things you'd want for your garden. You can even pick up seed packets if you'd like to have a go at growing some tropical plants yourself back home. One of the hardiest plants to grow is the orchid, which tends to do well in most indoor environments and comes in an incredible variety of flower types. This market is the go-to destination for souvenir-hunters in search of arts and crafts. It's famous for its religious charms and Buddhist amulets. For many visitors, these are cherished souvenirs because they are not available in most of the other shops and can be an extremely meaningful gift, especially for the more spiritual people in your life. This is also one of the best places to purchase hand-carved crafts, and many artisans offer extremely reasonable deals on shipping back to your country of origin. This is a great opportunity to experience breakfast as the Thais do, by eating noodle dishes or any other option available. This market is run by the Muslim Chin Haw people and differs from the other markets because it offers an enormous variety of Chinese dishes as well as Thai and is also a great place to try Myanmar (Burmese) cuisine. The fresh produce available at this market is excellent for those wishing to try their hand at cooking recipes from Thailand and the surrounding nations. If you've had enough of the market experience and are looking for something a little higher-end, you need look no further than the boutiques of Chiang Mai's Nimman area. These are wonderful locally-owned businesses where you can pick up a bag or cosmetics. Boutique shopping is a great way to support local artisans and acquire souvenirs that will last a lifetime. If you're keen to buy arts and crafts from local suppliers then the boutiques might be just what you've been looking for. The northern city of Chiang Mai has long been a destination for shoppers. It was once the destination of silks and tobacco transported via the trade routes from China. Today, the city maintains that longstanding tradition and it would be difficult to visit all the markets in a single trip. Still, there's nothing a bargain hunter likes more than a challenge, and visitors will find ample opportunity to empty their wallets and fill their suitcases on the streets of the city. It's a haggler's paradise and you'll find yourself bagging an excellent deal left and right as you visit the markets throughout the city. You'll have the memories of the delicious street food and the carnival atmosphere to take home along with your souvenirs. 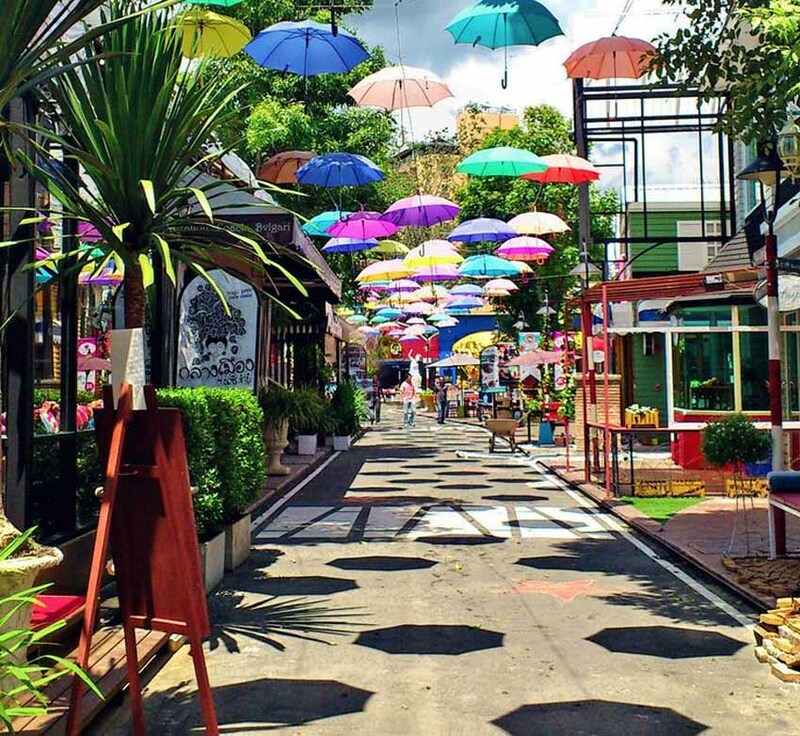 Chiang Mai is a shopper's dream come true, and offers some of the best bargains in Thailand. Take a short culinary getaway to Chiang Mai and explore around Nimmanhemin area, the center of cultural and culinary collage of this Northern city. Visit fresh market with Chef Phubase, who will help you pick locally produced ingredients to create your favorite meal for two. Then, head up to Rise Bar to enjoy a Private Bartender Class with a beautiful sunset from the roof top. This Chiang Mai Hotel offers an intimate and exclusive all-suite luxury hotel experience.